For five thousand years, things have stayed pretty much the same for Xi and his fellow Bushmen. Then one day, an empty coke bottle falls from a plane that is flying overhead nearly hiting Xi. Excitedly he shows all the other tribe members the gift from the gods and although they have no idea what it is they soon find many uses for it. It becomes a valuable tool but also starts to change the way they interact with each other – the person controlling the ‘tool’ has the power and soon emotions not usually present in their society such as envy, jealousy and greed rear their ugly heads. The ‘gift from the gods’ ends up with the bushmen fighting and it is not long before they believe that the bottle is evil. Xi decides that he must journey to the edge of the world to return it to the gods. On his quest Xi encounters terrorists and the so-called ‘civilised’ world. The Gods Must Be Crazy I (1980) 1 hr 44 mins approx. 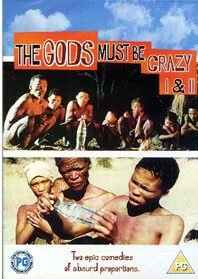 The Gods Must Be Crazy II (1988) 1 hr 36 mins approx. I loved the movie.. 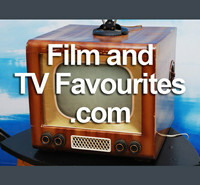 I ve watched it many times but this is the first time I came across a blog for the movie.. I wanted to know if there are only 2 parts of the movie.. I read on wikipedia that there are more sequels.. I wish I could get them.. Thanks for the blog.. twas really interesting.. I think there were five ‘Gods Must Be Crazy’ in total (not all directed by Jamie Uys though). I don’t know if the other films have been released on vhs or dvd – I have only ever seen the first two. My late father took me to see The Gods Must Be Crazy when it first came out in the theaters. I loved it then and I love it now. I have seen it and the second one several times since then. I just got it from Net Flix and watched it again last night. I had forgotten just how funny it really is. The second one is just as good and the first one.